A wrestling match between two men, one of whom claimed to be the champion of the world, would cost George Katis of 100 South Olive Street his pride and $2,250 ($26,701.42 in current dollars), when the match turned out to be a fake. George had been out for a stroll in a local park when he bumped into a pair of wrestlers. The men said that they had a way for George to make a bundle; all he had to do was to put up $1000 as a forfeit, make a side bet of $1250 on a match between them, and back up the truck to cart off his winnings. This sounded like a sure thing to George who promptly ponied up the cash, and agreed to meet the wrestlers at their hotel on Hill Street the next day for the bout. The following day George arrived at the designated meeting place as promised, but neither the wrestlers nor his money turned up. The hotel desk clerk informed the poor sucker that the men he’d described were not even registered there. George may be forgiven for taking a tumble on the fake match, because during the 1920s wrestling was extremely popular and there were many wrestlers and promoters touring the country. Unfortunately not all of them were on the up and up, as George had discovered. There were crooks and con artists in wrestling, but there were some honest Joes too. Some of the straight shooters were showmen, and would become legends. Wrestling as entertainment originated with the "Gold Dust Trio". 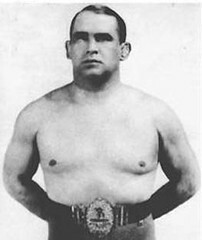 The trio included wrestler (and REAL World Champ) Ed "Strangler" Lewis (see photo), promoter Toots Mondt, and Lewis’ manager Billy Sandow. Modern wrestling owes a huge debt to the Gold Dust Trio, and especially to Toots, who convinced Lewis and Sandow to implement a new form of wrestling which combined features of boxing, freestyle, and most importantly, theater. Dubbed "Slam Bang Western-Style Wrestling", it was a huge hit with fans. So, the next time that you’re parked on your sofa in front of your big screen TV enjoying a WWF Friday night Smackdown, send up a silent thank you to Strangler, Toots, and Billy.